Don’t let flu season take you out of the game! 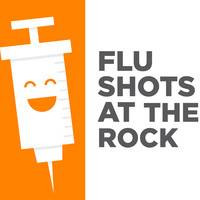 The UT Student Health Pharmacy is offering flu shots at The Rock on Friday, September 21st. According to the CDC, every healthy adult should get a flu shot. That means you! Join us to learn more about how to prevent the fluand survive this flu season. Fun giveaways will also be provided. Please bring your health insurance card and your prescription insurance card. Flu shots are free with health insurance. $25 without. Cash, credit, or debit cards accepted. Corner of Volunteer Blvd. and Pat Head Summitt St.